The fight-back against the Tory* government finally started in London yesterday. A large group of people finally recognised that walking down the road and listening to some speeches is no longer enough. Condemnation has predictably started to flow, not just from the right-wing press, but hand-wringing liberals and many parts of the “leadership” of the student movement. That’s “leadership” in the sense of “people who want to go into politics when they finish” and is about as connected to their membership as the Labour Party was to theirs before they lost most of them. To be clear, throwing dropping heavy things from the roof was bloody stupid [edited after seeing the Channel 4 video], but that’s as far as I’ll go in “condemnation” of the “violent extremists” who smashed up Tory HQ, even though I was one of the “peaceful” demonstrators. Let me repeat, it was Tory HQ! 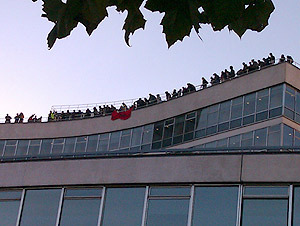 Red and black anarchist flagsi were waving on top of TORY HQ!!! As John Pilger rightly points out in this week’s New Statesman – direct action is the only thing that works. Whether it’s an illegal rave in the centre of London or smashing in the windows of Tory HQ, they’re all signs that things are finally starting to boil over and people are preparing to fight. And it’s a fight we didn’t start – the Tories declared class war the moment they took power. Cuts to services that will rip the heart out of welfare state, cuts to benefit that will drive people into poverty and possibly homelessness, threats to strip trade unions of even more of their rights – the list goes on. These isn’t just politics as normal, this is ideological warfare by the rich against the poor. We have got to fight back in the only ways we can – taking to the streets not to march, but to blockade. Entering buildings not to complain, but to occupy. We need an end to the politics of symbolic protest, an end to the slacktivism of pointing and clicking online and the rebirth of a true radical movement. Today’s action by some students isn’t to be condemned, it’s to be learnt from. It’s time for the workers’ movements to move beyond ballots, legal challenges and well-ordered pickets and start fighting like never before to take over. Stopping the cuts isn’t enough, we need to fight for a new world based on equality and freedom, not on millionaires and their friends. ¡Ya basta! * No more of this ConDem nonsense, they’re all Tories now. Can you start with the X Factor, please?